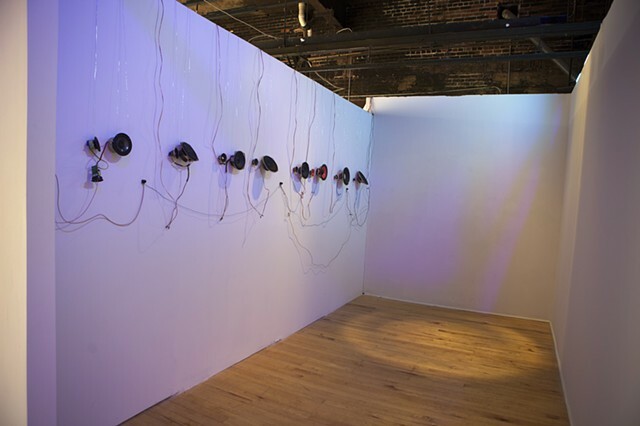 An interactive sonic installation that uses viewers movements through space to modify, in real time, a 4 channel soundscape composed of performances by interdisciplinary artist Laura Curry and Dutch experimental music duo Siti Bauw. The soundscape is composed of phrases one hears on the street spoken with the intent of attracting anothers attention. One channel mimics the language of catcalls, another the word hey, another the language of one intimate protecting another, and the last the language of friends running into each other on the street. As viewers approach the speakers their distance is detected by ultrasonic sensors and the open source software Pure Data uses this information to shift the soundscape from harmonic enticements to come closer to distorted admonishments to move away. A sample of the undistorted, harmonic, hey audio from one of the four channels can be heard here.